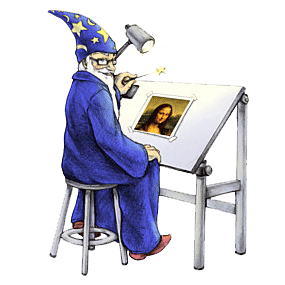 ImageMagickTM, is a free software suite for the creation, modification and display of bitmap images. ImageMagick is free software: it is delivered with full source code and can be freely used, copied, modified and distributed. Its license is compatible with the GPL. It runs on all major operating systems. Most of the functionality of ImageMagick can be used interactively from the command line; more often, however, the features are used from programs written in the programming languages Perl, C, C++, Python, PHP, Ruby, Tcl/Tk or Java, for which ready-made ImageMagick interfaces (PerlMagick, Magick++, PythonMagick, MagickWand for PHP, RMagick, TclMagick, and JMagick) are available. This makes it possible to modify or create images automatically and dynamically. ImageMagick supports many image formats (over 90 major formats) including popular formats like TIFF, JPEG, PNG, PDF, PhotoCD, and GIF. Describe the format and characteristics of an image.